Gerry Joe Weise visual artist was born in 1959, Sydney, Australia. 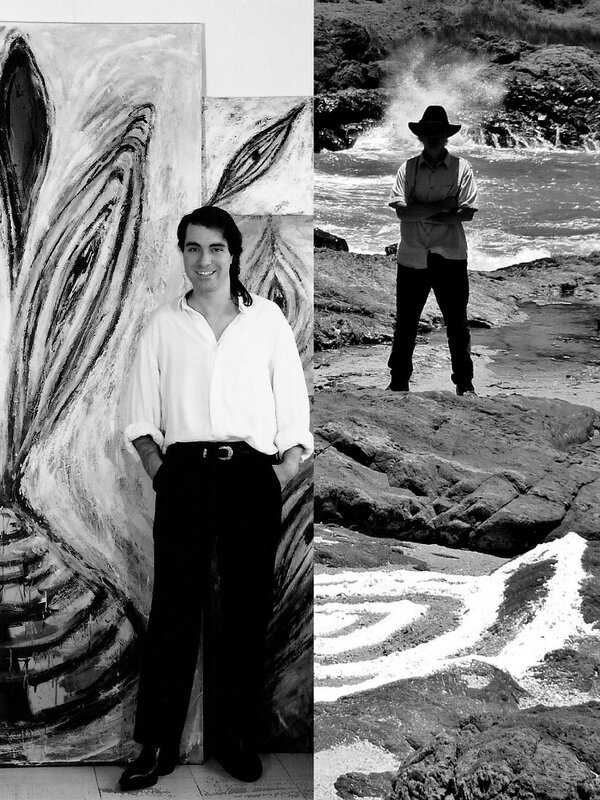 Award winning visual artist, has lived in Australia, France, Germany, Switzerland and the USA. He has exhibited in over 70 solo and group exhibitions across the globe. He is a professional photographer, an accomplished video-maker, and a computer programmer for audio and image. He is known for the following categories: Earth Art, Land Art, Installation Art, and "In Situ". His artwork can be found in museums, galleries, cultural centers, private and public collections; in New York, Los Angeles, San Francisco, Chicago, Paris, Hamburg, Frankfurt, Munich, Bonn, Brussels, Montreux, Sydney, Melbourne, Brisbane, Adelaide, Darwin, Auckland. Gerry Joe Weise Land Art links. ​​Gerry Joe Weise, Land Art Designs on sale. 1968 -1st prize, 9 years old, Drawing Competition, TV Channel 9, Sydney Australia. 1987 -Gold Medal, Grand Prix de France, Visual Arts, Reims, France. 1989 -2nd Prize, Public Choice Award, Grand Prix, Paris, France. 1993 -1st Prize, Graphic Drawing, Art Show, Brussels, Belgium. 1997 -Best Installation Award, for "Earth Painting", CCA, Munich, Germany. 2015/16 -Voted Number #3 in Land Arts Info Magazine / Top Votes, Paris, France. 1985. Galerie La Grande Serre, Rouen, France. 1986. Mythorhythmic, Centre Culturel Les Archers, Cambrai, France. 1986. Centre Culturel, Gaillon, France. -5. Cafe du Palais, Reims. 1988. Australian Embassy, Bonn, Germany. 1988. Australian Embassy, Brussels, Belgium. 1988. C.D.I. College Notre-Dame, Reims, France. 88/89. Centre Culturel Espace 13, Paris, France. 1989. Earth Music, Centre Culturel Ocre d'Art, Chateauroux, France. 1989. La musique des signes, Opus Gallery, Reims, France. 1989. Sacred Earth Music, Espace Tresor, Reims, France. 1990. The Sacred - Looking Up, Arthur Rimbaud Museum, Charleville-Mezieres, France. -3. Radio Station 93FM Gallery, Reims. 1991. Underworld Earth Works, BK Galerie, Frankfurt, Germany. 1991. L’Utopie, Espace AGF, Reims, France. 1993. Earth Spiral, CAC, Brussels, Belgium. 94/95. L'Utopie, Centre Culturel Ancien College, Sezanne, France. 1997. Ground Painting, CCA, Munich, Germany. 1998. LB Art Gallery, Montreux, Switzerland. 2000. Galerie Jiwini, Albi, France. 00/01. Galerie Out Of Australia, Toulouse, France. 2002. Earth Spirit, Centre Culturel Les Salvages, Castres, France. 2005. Distorted Nature, Ancien Temple, Lacaze, France. 2006. Nightscapes, Jam Factory, Adelaide, Australia. 2007. Nature Wide, Junction Gallery, New York City, USA. 2008. New Real Nature, Kunstverein, Buchholz IdN, Germany. 2013. 12 Months / Les Douze Mois, Mediatheque de Montreuil, Laon, France. 2013. Earth Lines - Land Art, pigments on outdoor ground earth, Sculpture Park, Cagliari, Sardinia, Italy. 2014. Draw a Thought / Dessiner une Pensee, Bibliotheque Municipale Patrimoniale Suzanne Martinet, Laon, France. 2015. Bark Paintings, Perspective Horizon Gallery, Sydney, Australia. 2015. Ground Paintings, Perspective Horizon Gallery, Sydney, Australia. 2015. Ground Paintings, Webster Art Gallery, Los Angeles, USA. 2016. Ground Paintings, Transient Land Art Gallery, Melbourne, Australia. 2016. Land Art Light Box Exhibition, Warehouse 80, Sydney, Australia. L.A.M.P. Land Art Multimedia Project: large-scale transparencies exhibited on translucent white surface with internal incandescent light source. 2017. 70th Exhibition Anniversary and Earth Art book presentation. Warehouse 80, Sydney, Australia. L.A.M.P. Land Art Multimedia Project: large-scale transparencies exhibited on translucent white surface with internal incandescent light source. 2018. Nature Art Lines, Wilson Gallery, London, Great Britain. 2018. Nature Art Lines, Land Art Gallery, Brisbane, Queensland, Australia. 2019. Contemporary Artist Space, San Francisco, California, USA. ​2019. Land Art, CHEC, Southern Cross University Library, Coffs Harbour, Australia. 1982 to 84. Schlosspavillon Gallery, Munich, Germany. 1987. Grande Prix de France des Arts Plastiques, Ancien College, Reims, France. -3. Galerie Clin d'Oeil, Toulouse, France. 1988. Grandeur Nature, SBAC Centre d'Arts Plastiques, Clamart, Paris, France. 1989. Installation THNO, Le Chant des Roches, Sculpture Park, Tinos Island, Greece. 1992. Sun Earth, Centre Culturel Co-Temporaire, Troyes, France. 1993 to 98. Galerie Ligne Roset, Reims, France. 2000. Parc des Expositions, Caen, France. 2000. Art Passions, Galerie d'Art, Boissezon, France. 2001. Earth Spirit / L'Esprit de la Terre, CCI, Castres, France. 2002. Earth Spirit / L'Esprit de la Terre, Centre Culturel Les Salvages, France. 2003. Earth Spirit / L'Esprit de la Terre, Chateau, Hotel de Vile, Brassac, France. 2004. Nature Nature, Sculpture Park, Lac du Merle, France. 2005. Installations, Sculpture Park, Brassac, France. 06/07. Galerie Ligne Roset, Reims, France. 2007. Where To Now?, Artist's Space Gallery, New York City, USA. 2009. Earth Spirit / L'Esprit de la Terre, Conservatoire, Laon, France. 2014. Earth Spirit / L'Esprit de la Terre, Centre Culturel Le Mail, Soissons, France. 2016. Sculpture Park 2016 edition, Bindarri National Park, Australia. 2017. World Nature, Kingston Art Gallery, New York City, USA. L.A.M.P. Land Art Multimedia Project: large-scale transparencies exhibited on translucent white surface with internal incandescent light source. ​2018. Ephemeral Artworks of 12 Artists, Powerhouse Arts Centre, Liverpool, Great Britain. 2018. My Land - Your Land, Contemporary Art Gallery, Sydney, Australia. 2019. Australian Artists, House of Arts Gallery, Munich, Germany. 1986, October. Exhibition catalog. Gerry Joe Weise - Mythorythmic. Centre Culturel Les Archers. Edition Les Archers, Cambrai, France. 1987, September/October. Exhibition catalog. Gerry Joe Weise - Transmythic Earth Retrospective exhibitions. Articles by Jean-Marie Le Sidaner and Gerry Joe Weise. Centre Culturel du CROUS. Edition Antigone, Reims, France. 1987, December. Artension art magazine, N#1. Gerry Joe Weise au CROUS by Jean-Marie Le Sidaner. Paris, France. 1988, February. Artension art magazine, N#2. Rituel Commun / Common Ritual - Gerry Joe Weise and Jon Cockburn by Jean-Marie Le Sidaner. Paris, France. 1988, May. Philosophy book. Flache Livre de Poche, N#1, Michel Butor special. Illustrations by Gerry Joe Weise. Edition Arthur Rimbaud Museum Library, Charleville-Mezieres, France. 1988, May. Exhibition catalog. Grandeur Nature. Centre d'Arts Plastiques Clamart. Edition SBAC, Paris, France. 1988, September/October. Art Line magazine. Australian Artists in Paris by Andrew Nuti. AGP Press, London, England. 1989, February/March. Exhibition catalog. Gerry Joe Weise - Music. Article by Ludovic Gibsson. Centre Culturel. Edition Ocre d'Art, Chateauroux, France. 1990, January/February. Artension art magazine, N#13. Gerry Joe Weise by Jean-Marie Le Sidaner. Paris, France. 1990, February/April. Exhibition catalog. Gerry Joe Weise - The Sacred. Articles by Jean-Marie Le Sidaner, Ludovic Gibsson, Romuald Krzych. Arthur Rimbaud Museum. Edition Rimbaud Museum Library, Charleville-Mezieres, France. 1990, June/August. Marges art magazine, N#2. Gerry Joe Weise - Sauver l'infini by Alexandre Ban and Jean-Marie Le Sidaner. Edition Ad Hominem, Reims, France. 1991, January. Artension art magazine, N#20. Gerry Joe Weise - Le Chant des Roches by Jean-Marie Le Sidaner. Paris, France. 1991, April/June. Marges art magazine, N#3. Peintres Du Monde by Gerry Joe Weise. Edition Ad Hominem Reims, France. 1991, November/December. Exhibition catalog. Gerry Joe Weise - l'Utopie. Article by Jean-Marie Le Sidaner. Espace AGF. Edition AGF, Reims, France. 1993, April. CAC Mag art magazine. Gerry Joe Weise - Earth Spiral. Edition CAC, Brussels, Belgium. 1997, January/February. Exhibition catalog. Gerry Joe Weise - Earth Painting. CCA, Munich, Germany. 2006, February. JF art magazine. Nightscapes - Gerry Joe Weise. Jam Factory editions, Adelaide, Australia. 2007, October. Exhibition catalog. Where To Now. Artists Space New York. Art Now editions, NYC, USA. 2007, October/November. Art Zac magazine, N#72. Where To Now Artists by David Kellner. Art Zac editions, NYC, USA. 2007, November. Exhibition catalog. Gerry Joe Weise - Nature Wide. Junction Gallery. Zart Press, NYC, USA. 2007, December/January. Art Zac magazine, N#73. Gerry Joe Weise and Nature Art by David Kellner and Catherine Defrisco. Art Zac, New York, USA. 2015, February/March. Exhibition catalog. Ground Paintings. Perspective Horizon Gallery. Horizon Prints Ltd, Sydney, Australia. 2015, April. Exhibition catalog. Ground Paintings. Webster Art Gallery. Art Editions, Los Angeles, USA. 2016, February. Exhibition catalog. Ground Paintings. Transient Land Art Gallery. Trans Texts, Melbourne, Australia. 2016, May/June. Exhibition catalog. Land Art Multimedia Project. Warehouse 80. LAMP Editions, Sydney, Australia. 2017, February. Exhibition catalog. World Nature. Kingston Art Gallery. Jorge Contemporary Press, NYC, USA. 2017, May. Zoneone Arts magazine. A Conversation with Gerry Joe Weise by Deborah Blakeley. Melbourne, Australia. 2017, July. Book. Earth Art, by Gerry Joe Weise, Ludovic Gibsson. Earthworks Australia, USA. ​2018, January. Book. Land Art, by Gerry Joe Weise, Ludovic Gibsson. Earthworks Australia, USA. 2019, April. Book. Environmental Art of Gerry Joe Weise, by Albert L. Sandberg, Kiera Mae Anders, Ludovic Gibsson. Earthworks Australia, USA.